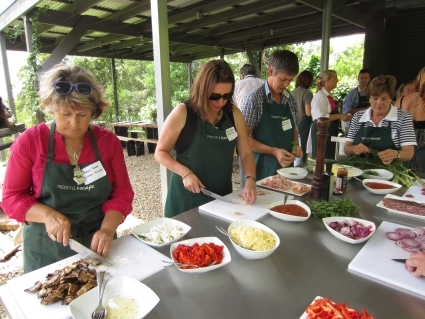 It was with some trepidation that I signed up for a cooking class at Freestyle Escape. The last time I ventured into a professional kitchen I rendered a salad inedible by liberally garnishing it with peppercorns (I thought they were lentils). But the minute I arrive at Martin Duncan’s outdoor kitchen perched high in the lush Sunshine Coast hinterland, my fears are allayed. It would be hard to imagine a more idyllic spot for a class. In fact, the sweeping views prove to be so distracting that twice during the course of the day I almost lop off the end of one of my fingers. This entry was posted in Australia, Queensland and tagged cooking school, Sunshine Coast by Rob McFarland. Bookmark the permalink.